When did weekends become all about errands and housekeeping? This weekend, in addition to the usual vacuuming, laundry and trips to the market and bank, I did some grout touch-ups to the bathroom (how do I even know how to do that?? ), removed and cleaned up the couple of A/C units we still had dangling out the windows and did a rather ghetto weatherproofing job to the hatch that leads from our backyard into the basement (it involved a blue tarp and some bricks). 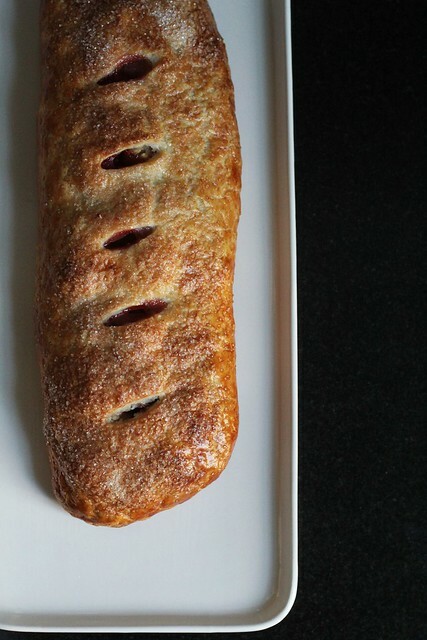 Carving out a little baking time on the weekends is a must. For me, even though there are always dishes to wash afterward, it’s pure fun. While I’ve never been one for most fruit and chocolate combos, I can do pears and chocolate together…Poire Belle Hélène is good stuff, afterall. 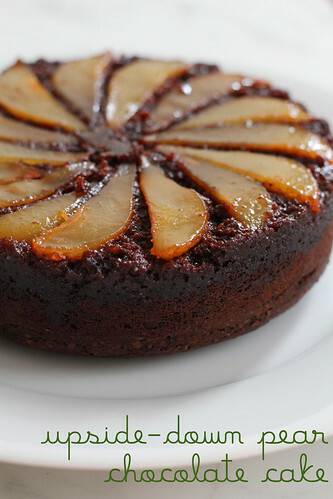 While I was flipping through the very sweet little book Rustic Fruit Desserts, this recipe for Upside-Down Pear Chocolate Cake caught my eye as a good and unusual way to use up the last of my CSA pears. Making an upside-down cake is always exciting. There’s the big revel– what’s going to happen when you turn it out of the pan?? Here’s what I got with this one: a perfectly moist and caramel-soaked chocolate cake with pears that turned a translucent, shimmering gold. I must say though, that just from tasting the raw cake batter, I knew we were in for a treat. I love the way the pears glisten in the light…this one might show up again for Christmas dinner. Steph’s Note: Regarding the caramel for the fruit topping– if you have another method of making caramel that you prefer (a dry caramel, for example), feel free to use it here, keeping the amount of sugar the same. This one worked perfectly for me, but do what you are comfortable with. -Preheat the oven to 350° F and butter a 9-inch round cake pan (preferably not a springform one). -To make the fruit topping, put the sugar and water in a heavy saucepan (one with a tight-fitting lid) and stir until the sugar dissolves. Bring the mixture to a boil over medium heat, then cover and cook for 2 minutes. (Covering in this way allows the steam to wash down the sides of pan, which will prevent any sugar crystals from forming.) Uncover the saucepan and continue to boil the sugar, gently and slowly swirling the pan as needed to cook the caramel evenly, until it becomes a dark amber color. Occasionally wash down the sides of the pan with a pastry brush dipped in cold water, if necessary. Carefully pour the caramel into the prepared pan and allow it to harden. The pan will be very hot from the sugar, so take care in moving it if you need to. Fan the pear slices on top of the caramel in a circle around the perimeter, filling in the center with the remaining slices. -To make the cake, place the butter and chocolate in a small saucepan over low heat and melt, stirring occasionally. Sift the flour, cocoa, baking soda, and salt together in a bowl. Transfer the melted chocolate to a mixing bowl or the bowl of a stand mixer and add the sugar. Using a handheld mixer with beaters or a stand mixer with the paddle attachment, beat on medium speed for about 3 minutes, until light and fluffy. Add the eggs one at time, scraping down the sides of the bowl after each addition. Stir in the vanilla. Stir in the flour mixture in three additions alternating with the milk in two additions, beginning and ending with the flour and scraping down the sides of the bowl occasionally. -Tip the batter into the prepared pan and use a spatula to move it to the edges and cover the fruit. Bake in the middle of the oven for 40 to 45 minutes, or until the cake bounces back slightly when touched. Cool on a wire rack for 15 minutes, then run a knife or small offset around the edge of the pan and invert the cake onto a plate, leaving the pan on top of the cake for 5 minutes before you remove it. 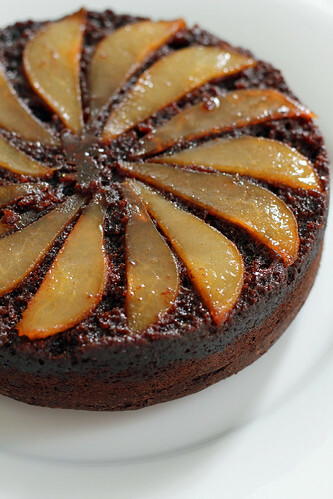 If any pear slices stick to the pan, just lift them out and place them on top of the cake. Serve the cake warm or room temperature. -Wrapped in plastic wrap, this cake will keep at room temperature for 2 to 3 days. Wow…it takes a move to make me realize just how much kitchen crap I have. Seriously, boxes and boxes of stuff I never touch. I have an 11-inch square pan that I used once eight years ago! I have five flats of unopened Ball jars (was I thinking I’d be the next Smucker’s or something??). A lot of it went into storage when we moved to Sydney four years ago, and it didn’t come out when we moved back. Until now. My latest project is sorting though it…what to keep handy, what to put in the basement and what to say goodbye to. Housing Works has already gotten three boxes full! One thing I’ll never give up is my six-inch springform, which I found just in time to make a half-size of the Fold-Over Pear Torte that Cakelaw of Laws of the Kitchen chose for TWD this week. 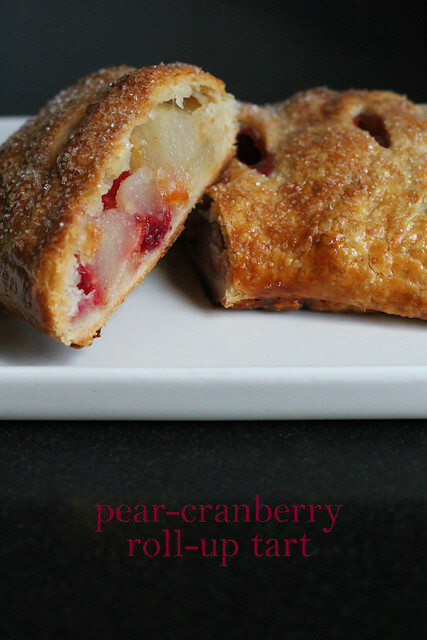 This was the first recipe in a long time where I didn’t know what the heck I was making! I couldn’t really tell by reading the recipe how it would turn out, and there isn’t a picture in the book for a visual clue. 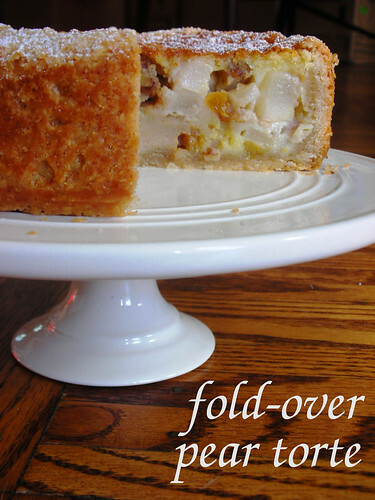 After muddling through and crossing my fingers, here it is in a nutshell: fresh pear chunks, nuts and dried fruit are suspended in a rummy custard-like batter, and the whole thing is encased in flaky pie dough. It’s assembled in a springform for high sides to hold all that fruit and custard. It may look like a deep dish pizza, but it tastes like pure autumn. A delicious surprise out of the oven! For the recipe, see Baking: From My Home to Yours by Dorie Greenspan, or read Laws of the Kitchen. Don’t forget to check out the TWD Blogroll! I feel like I’ll be dealing with leftover turkey forever, but the holiday bundt is all gone now. 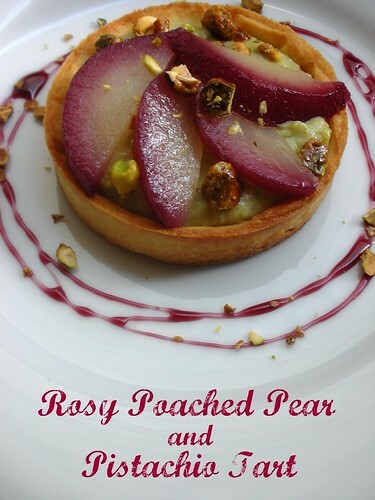 Time to move on to the Rosy Poached Pear and Pistachio Tart that Lauren of I’ll Eat You picked for TWD. I will be honest and admit that making it was a bit more work than I felt like doing after just having prepared Thanksgiving dinner a couple of days before. 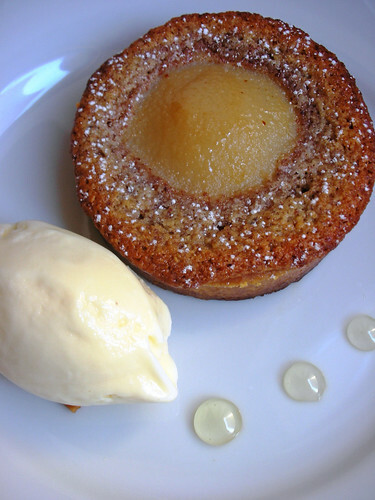 You have to make tart dough, pastry cream, poached pears, caramelized nuts and sauce. That’s a lot of stuff, but the payoff is most definitely worth the effort. 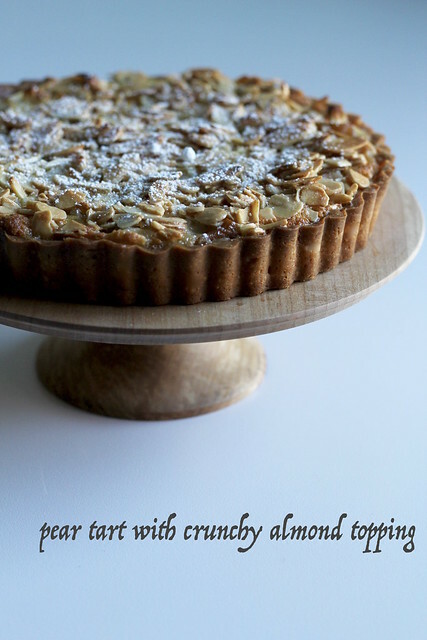 This is a stunningly delicious tart! Pastry cream-based tarts don’t hold up so well overnight, so I made individual tartlette shells that I could fill with the pistachio pastry cream as needed. I haven’t had JELL-O pistachio pudding in years, so I’m not sure if I’d love it today as much as I did when I was little, but this pastry cream is spot-on for my tastes now…little flecks of nuts and the color is a far more “natural” green. I used bosc pears for poaching, and they sucked up all that gorgeous color from the red wine. BTW, the chilled poaching liquid tastes an awful lot like sweet sangria to me…hmmm…keep me away from the leftovers or I may wind up with a lampshade on my head! For the recipe, see Baking: From My Home to Yours by Dorie Greenspan, or read I’ll Eat You. Don’t forget to check out the TWD Blogroll! I spent a good portion of today thumbing through some back issues of Gourmet. I’ve been an on-again, off-again subscriber to the magazine for years. I let it expire, I miss it and I come back to it. I took it for granted that I would be able to continue this pattern for years to come, but looks like I was wrong. And that’s such a shame, because even though there’s so much food-related content out there right now, I could always count on Gourmet to have interesting and topical articals, inspirational recipes and beautiful pictures. I told you yesterday that I’d make you something from the pages of Gourmet, so I leave you with this recipe for a really tasty Pear Butterscotch Pie from the recent September issue. My husband, who also enjoys a good flip-through of each new issue (and bookmarks requests), pestered me to make it all last month. 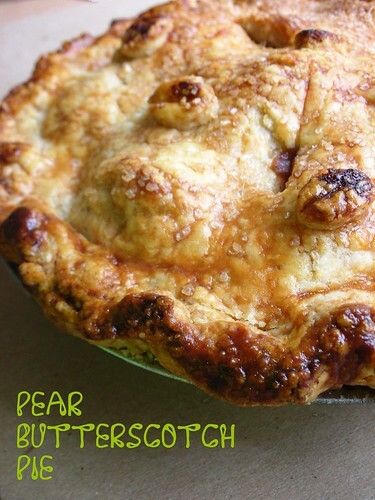 The flavors remind me more of apple pie than butterscotch, to tell the truth, but the dark brown sugar and the big chunks of pear are enough to make it a little more unusual. Spike your whipped cream with a little bourbon, and you’ll add to the butterscotch feel! Notes: Pie is best the day it is made but can be baked 1 day ahead. The leaf cutouts described below are optional, as they are decorative only. – Put a baking sheet on middle rack of oven and preheat oven to 425°F. – Whisk together flour, cinnamon, nutmeg, and salt, then whisk in brown sugar, breaking up any lumps. Peel the pears, cut each into 6 wedges, and core. 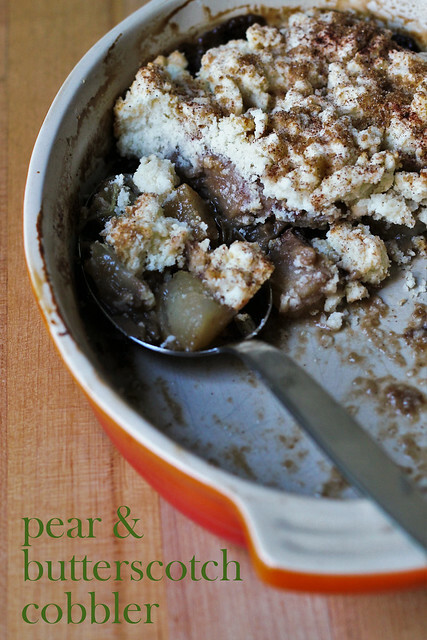 Gently toss pear chunks with brown sugar mixture, lemon juice, and vanilla and let stand 5 to 15 minutes to macerate fruit. – Roll out 1 piece of dough (keep remaining disk chilled) on a lightly floured surface with a lightly floured rolling pin into a 13-inch round. Fit into a 9-inch pie plate. Roll out remaining piece of dough into a 13-inch round. Reserve scraps. – Transfer filling to shell. Dot with butter, then cover with pastry round. Trim edges, leaving a 1/2-inch overhang (reserve scraps). Press edges together to seal, then fold under. Lightly brush top crust with some of egg wash, then cut 3 (1-inch-long) vents. – Roll out dough scraps about 1/8 inch thick and cut out leaf shapes with small leaf cutters (or a knife). 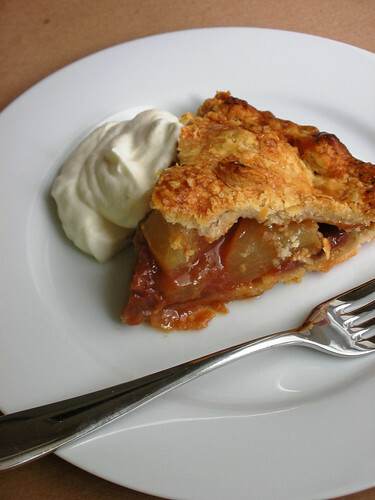 Arrange decoratively on top of pie, pressing gently to help them adhere. Lightly brush top crust and cutouts with some of egg wash and sprinkle with granulated sugar. – Bake pie on hot baking sheet 20 minutes. Reduce oven to 375°F and bake until crust is golden and filling is bubbling, 40 to 45 minutes more. 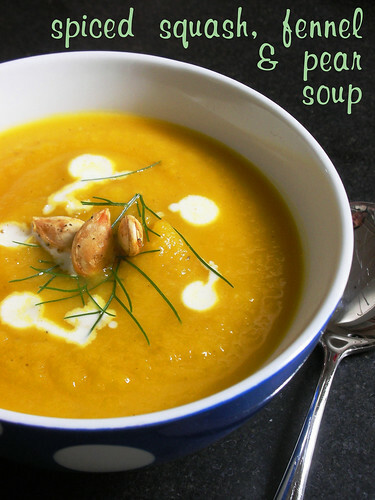 Cool to warm or room temperature, 2 to 3 hours. Guess what — this is my 50th Tuesdays with Dorie post!! Seems quite appropriate that my TWD golden anniversary be celebrated with a golden dessert, chosen by none other than Dorie Greenspan herself. Dorie has picked a French Pear Tart for the group to bake this week. This tart is a classic French dessert. 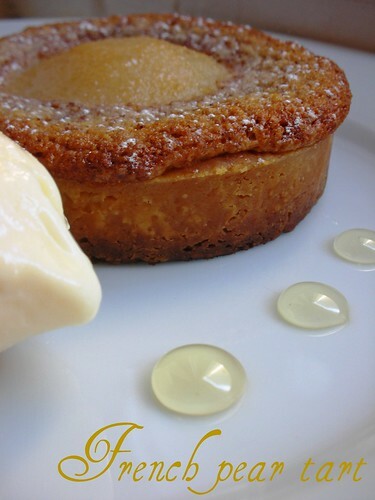 It has three main components: pears, almond cream (frangipane) and a sweet tart dough (pâte sablée). Dorie says that it is most acceptable to make this tart using canned pears, but here I used fresh ones, poached in a sugar syrup until deliciously soft and sweet. 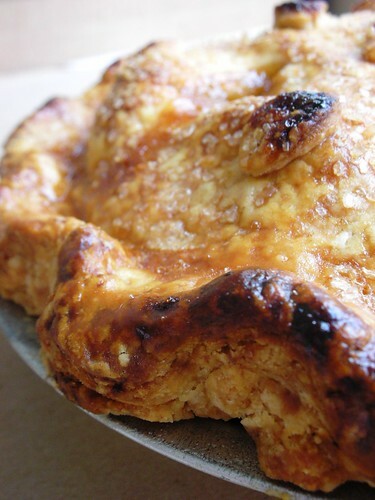 Regular pie dough is flaky, but sablée is like a sweet crisp, butter cookie. (Incidentally, we make a type of sweet tart dough at the bakery where I work. It is affectionately referred to as “STD”…we are a classy bunch.) When the almond cream bakes, it puffs up around the pear, becoming almost cake-like. 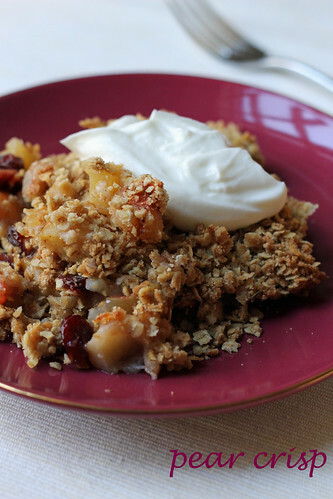 If you make this and poach your pears, too, please don’t throw out the poaching liquid! I’ve learned from working in restaurants that there are a million uses for poaching liquid. It can be made into a granita or turned into sorbet base. It can be reduced to a thicker syrup, and used in cocktails, over ice cream or to decorate a plate (like I did here). Or it can simply be used to poach more pears. You can also add things to the liquid to give additional flavor, like wine, vanilla bean or whole spices. I made individual tarts, which I assembled and baked off as needed, since I figured a big one would go soggy before we could get through it. Rather than fanning out cut slices of pear, I just used one of its “cheeks” in each tartlette. Doesn’t it look a little like a fried egg when viewed from above? I served the baked tartlettes with a vanilla goat’s milk ice cream from Laloo’s. For the recipe for this delicious tart, look on Dorie’s blog or in her book, Baking: From My Home to Yours (she also has a version of it here on Epicurious). Don’t forget to check out the TWD Blogroll. So, fifty recipes from BFMHTY…what are my favorites so far? Honestly, they’ve almost all been winners, but I regularly daydream about Bill’s Big Carrot Cake and Almost-Fudge Gâteau. What do I hope someone will pick soon? Every month I keep my fingers crossed that Oatmeal Breakfast Bread, Coconut Tea Cake or any of the Bundts will be on our list.